One of the questions I get asked most about the way I eat is: ‘What do you have for breakfast?’. The answer is a smoothie. I love a lazy breakfast as much as the next person and will happily spend time making pancakes, but the reality is that most days I don’t have time. And frankly, if I’m getting up at 7am all I can deal with is something simple. I drink a green smoothie with protein for breakfast almost every day and I honestly feel great for doing it (it’s been so long now that it’s what my body craves). Strangely, I feel fuller than when I used to eat porridge for breakfast, and my stomach is no longer rumbling by 10.30am. The protein powder I use is probably responsible for this. (Be warned: your smoothie won’t fill you up if it doesn’t have protein in it!) 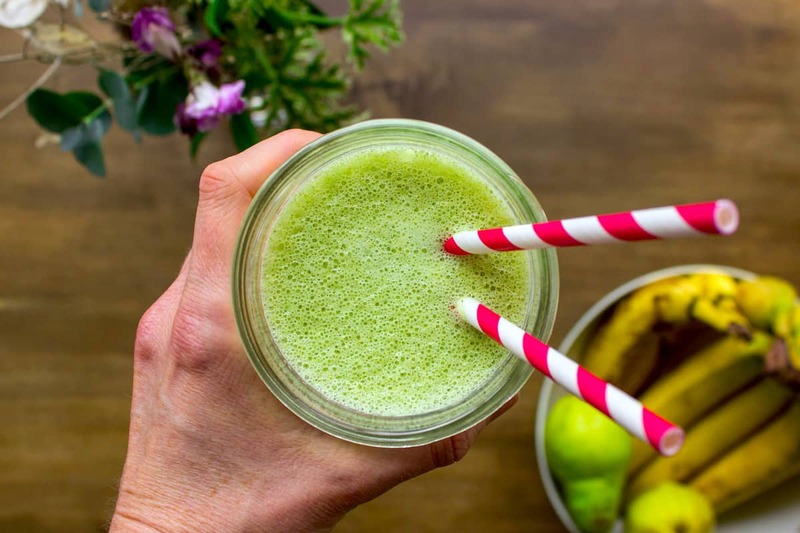 This Everyday Breakfast Smoothie is a fantastic way to get raw fruit, vegetables and vitamins into your body without feeling like you’re crunching down on a stick of celery. You can also add superfoods to your smoothie like cacao, spirulina, greens, lucuma, maca and goji berries for an extra nutrient boost! I’ll be honest: the smoothies I drink each morning are a bit greener and less sweet than this one. I don’t recommend starting with those if you’re used to a sweeter breakfast – you’re better off trying this one out and gradually adding more veggies and less fruit over time. Vegetables are great as you don’t really taste them when they’re blended and they add so many nutrients, plus it’s important not to have too much sugar first thing in the morning (you don’t want your energy levels to spike and crash). I’ve created this recipe so you can use it as a jumping-off point, but feel free to add other ingredients and create your own Everyday Breakfast Smoothie! 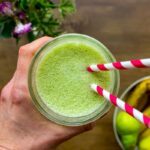 A simple, nutrient-packed and delicious green smoothie - vegan, gluten-free, energy-boosting and perfect for everyday breakfasts. Pour into a tall glass and drink immediately! Note: Feel free to adapt this recipe to suit your own tastes. Some great additions include berries, nuts, maca, hemp or flax oil, chlorella, kale and ginger.